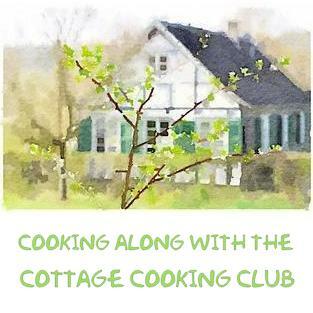 Welcome to our March edition cooking along with the Cottage Cooking Club. We are now in our twenty-thid month of our online international group cooking from the cookbook: “River Cottage veg everyday!” by Hugh Fearnley- Whittingstall. Our motto for this month from our fearless leader, Andrea Mohr, of the Kitchen Lioness, Notes from a very small German Kitchen, is “Hang in there, we have almost made it.” That is, with 2 remaining posts our group is nearing the end of cooking through this cookbook which has, over these almost 2 years, provided us with many lovely dishes, inspirations in vegetable preparations, and most importantly, the bonding of new online friends monthly sharing their observations, circumstances, and perhaps some personal experiences that have shaped our lives in some way during the time of dish preparations. 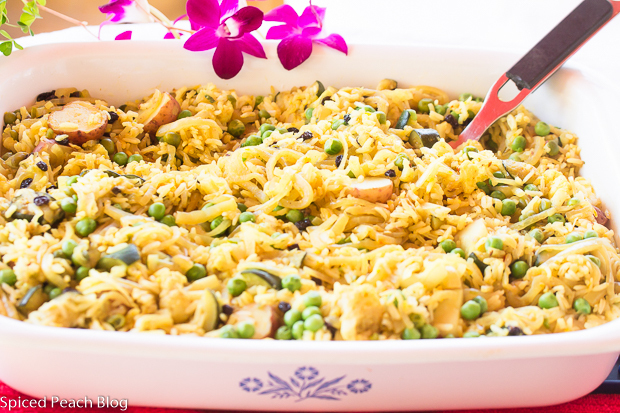 This month I prepared the Vegetable biryani, the second occasion that I’ve prepared this dish for a buffet, though I didn’t have the opportunity to photograph the first time preparation. The dish was enjoyed both times with one curiosity. Proportionately, I thought the second time had too many onions, and it occurred to me that I had made a mental note of this the first time around, using just 2-3 large onions as the base in my initial preparation slowly cooking along with the bay leaves, cardamom pods, and cumin seeds. After the long sauté then adding in the garlic, ginger, and hot pepper, I doubled the spice ratio to two teaspoons each of cumin and coriander, one teaspoon of cinnamon, along with adding in a teaspoon of turmeric which seemed to provide the right blend with less onions, but with the 5, left my family looking for just a bit more, but not too much so, depth. 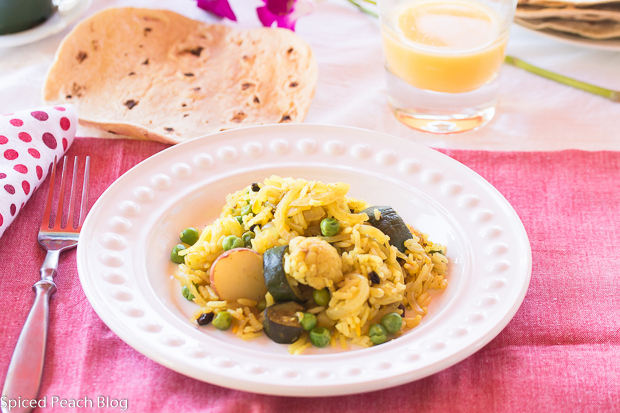 Cooking the saffron in the rice added a scented enchantment to the house and this combined well topping the curried ingredients. Having cauliflower and zucchini on hand, I used these instead of carrots, also reducing then the number of baby potatoes with the similar given amount of peas. I do love this dish but might like to develop it just a bit more. As you read this post I shall be on my way to visit my sister and brother in-law in Las Vegas for a few days before going on to the International Association of Culinary Professionals Conference in Los Angeles. I’m so excited! Emoji. Big Smile. I’ll do my best to check in on everyone’s post as able. You can check out what other Cottage Cooking Club Members are Cooking here. This entry was posted in Cottage Cooking Club and tagged March Cottage Cooking Club, River Cottage Veg Everyday, The Cottage Cooking Club, Vegetable, Vegetable Biryani. Bookmark the permalink. Post a comment or leave a trackback: Trackback URL. Thank you Kelly! I’m now home and what a trip! I thought of you frequently actually, and thought you might have a really good time too! There were not a lot of celebrity chefs but it was mentioned though among a few of those who are members that member chefs used to be more prominent. The event overall though is definitely not focused around ‘show’ or social media and rather very relationship oriented and interactive engagement. Very refreshing and I learned quite a lot besides enjoying lots of good food, drinks and being with lots of terrific folks! I bought the ingredients for the biryani, but didn’t get a chance to make that one. Hopefully I get to it early in April. I’ll be wary of the onions. I hope you have a great trip, both with your relatives and the convention. Have fun and tell us about it when you get back! BTW, I keep forgetting to tell you that I will be attending a wedding in Blue Bell in September, so I hope we can meet up in person when I’m there. 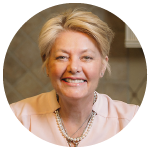 Hi Betsy, so great to see you after a wonderful trip in Vegas and the IACP conference in LA which was amazing! So much fun,lots to learn, great food, drink, and fabulous folks, but very, very busy from 7:30 am until 10:00 each day! I’m so excited to have the opportunity to meet you in person in September. Please send me the date so I can mark it down and let me know your timing on your visit! Shall I guess that the reception is at the Farmer’s Daughter in Normandy Farms? If so, you are right across the street. If it is in Blue Bell Country Club- you are in my development! William Penn Inn… down the street, where I had my wedding reception! Can’t wait!